Powers/Abilities: Wayne Gifford was a normal human trained at home using weights. The Basilisk was a tall, very strong reptile-like humanoid with long feet, and sharp teeth and claws. He was very probably stronger than Morbius. Basilisk was very agile, and using his claws was able to climb walls. He had a paralyzing gaze that blocked the victim, not allowing him to move. The Basilisk's weakness was the truth about his existence that came out every time he looked at his own image in a mirror. History: (Morbius the Living Vampire#5 (fb)) - At an early age, Wayne Gifford lived with his father and was repeatedly brutalized and depravated by him. The rage and the evil in Gifford, in the years, creating a second personality in him. Gifford found his purpose in inflicting pain and suffering to others, in particular innocent people. When he was about 14, Wayne Gifford killed and mutilated Shannon Gertz, a 14 years old girl. Gifford trained his body, usually read pornographic magazines, and he also had his body tattooed with the picture of a long-tail basilisk. He killed other people waiting for the day of his real birth many years later. (Morbius the Living Vampire#4 - BTS) - Gifford killed another man, out some parts of the body in a trunk and devoured some others. (Morbius the Living Vampire#4) - Later, when the police were investigating on the crime scene, Gifford watched from far. 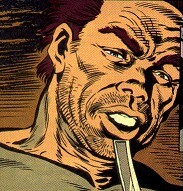 (Morbius the Living Vampire#5) - To become the Basilisk, Gifford performed a rite in a pentacle and cut his own throat with a razor. The Basilisk emerged free from Gifford's blood. He looked at his real image in the mirror and saw only Wayne Gifford. Enraged, not being able to face the truth, he smashed the mirror, the window, and jumped in the streets. Soon he met a woman who was fleeing from a group of hooligans and was previously saved by Morbius the Living Vampire. The Basilisk paralyzed the woman with his gaze, and he was attracted by her sweetness and innocence. 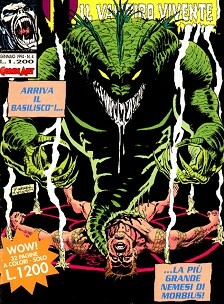 (Morbius the Living Vampire#5 (fb)) - The Basilisk drew the woman and beheaded her. Then he hid himself on the closest roof. (Morbius the Living Vampire#5) - Morbius arrived on the scene and the Basilisk attacked him. (Morbius the Living Vampire#6) - The two tangled in puddles, then the Basilisk used his paralyzing gaze against Morbius who used his hypnotic powers upon Basilisk. The result was that for some seconds the two relived each other's memories. The Basilisk decided that Morbius was prey and attacked him again. During their fight they pushed each other in a bar where a concert was live. The Basilisk started to slash people, but Morbius scratched his back, and attracted him out of the bar. The Basilisk pursued the Living Vampire on the roofs then was forced by Morbius to look at his real image in the glass of a windows. He saw Wayne Gifford, this reminded him that he was only an illusion created by Gifford's evil and slowly his flesh melted, leaving only bones and blood. (Morbius the Living Vampire#24) - The Basilisk's psychic residue survived its death, and eventually sought out the grave of Gifford, and remerged with his remains, regaining its life. The Basilisk burst from Gifford's grave, and devoured some of the Cypress Hills Jokers gang for their blood. Next, it attacked an ambulance to devour its medics, then questioned the vehicle's patient, recognizing Morbius' scent on him from an earlier encounter, and the victim directed the Basilisk to the Aquarian Center. The Basilisk attacked Morbius and his companion Crystal at the Aquarian Center, and Morbius made it see its reflection again, but the Basilisk no longer believed itself to be Gifford, and rejected its previous weakness. It also condemned Morbius for feeding off those he deemed evil, calling him a hypocrite for thinking he knew the difference between the innocent and the guilty. Morbius sucked the Basilisk's blood until it disintegrated, its form again dispersed. However, it soon reformed itself within the sewers, vowing to have revenge on Morbius one day. Comments: Created by Len Kaminski, Ron Wilson and Mike Witherby. 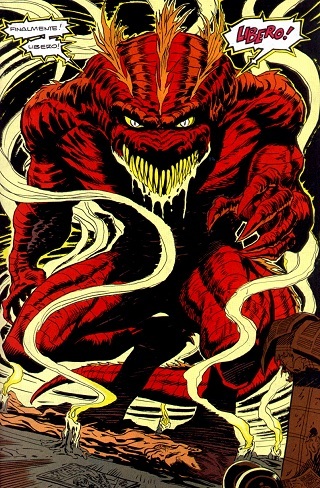 On the cover of Morbius the Living Vampire#5 and #6 the Basilisk was coloured green, in the issues, red.